Watani is one of the largest Supercenters in the Kingdom with its first store open in Jeddah in 1996, The store is located at Tahlia Street and Ring Road. Since then four further Stores have opened in Makkah, Riyadh and Jeddah. Further Stores are planned for 2008/9. Watani features a full line of food products, including a full bakery, delicatessen, fresh produce, meat and seafood. Our stores specialize in General Merchandise that features clothing and shoes as well as electronics, domestic products, toys, appliances, hardware, household and electrical products. We feature over ninety thousand individual SKU's for the customer's preferred variety and needs. Watani has a unique marketing approach of serving both the large families needs as well as those of smaller households. Our customers have the opportunity to purchase items in full case lots with special low prices or single items for their smaller needs. Watani has based its marketing approach on four basic objectives. These are Quality, Variety, Value and Customer Service. 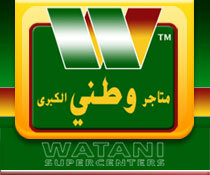 This marketing approach has been the driving success in making Watani the most successful Supercenters in the Kingdom. Watani Trading Company is a limited entity managed by a Board of Directors and a professional management team. Watani Stores in Tahlia Street and Makkah are open 24hrs.